Thomas Dorsey wrote this number following the deaths of his first wife and baby daughter in 1932. Dorsey wrote of the song, "This is the greatest song I have written out of near four hundred." The Heavenly Gospel Singers were formed in Detroit in 1927, but used the name for the group only from 1933. After considerable success while on tour, the group was given a recording contract in 1935. 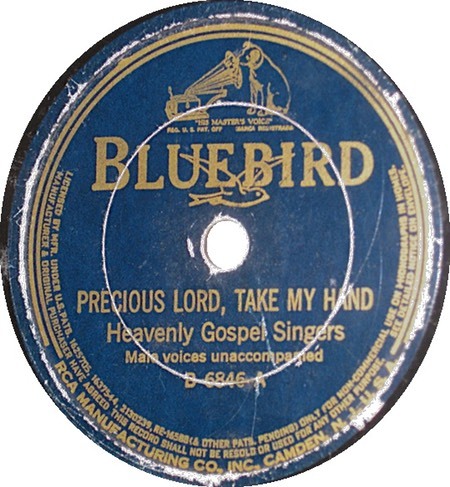 The Heavenly Gospel Singers made the original recording of "Take My Hand, Precious Lord" on 16 February, 1937; it was issued as "Precious Lord, Take My Hand" on Bluebird B6846. That same year the Heavenly Gospel Singers made the first recording of "Bosom of Abraham," under the title "Rock My Soul." The Heavenly Gospel Singers continued with numerous personnel changes until the early 1950s, when they disbanded. The Golden Gate Quartet also recorded the number in 1939 and the phrasing they use is very similar to that used by Elvis. Thomas Dorsey died in 1993.